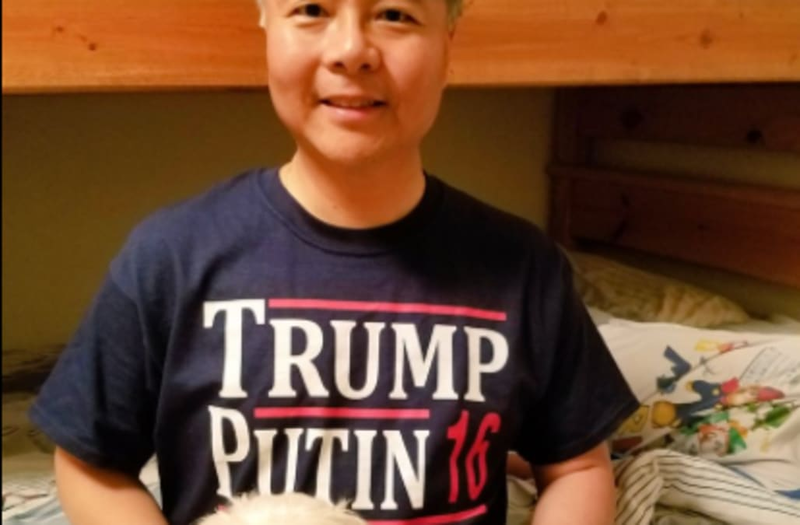 Rep. Ted Lieu of California tweeted an image of himself and his newly adopted puppy on Tuesday, paying no mention to his glaring attire. "We just adopted a dog! His name is Abbot and he is a very cute one-year old Multipoo," Lieu wrote as a message to go with the image of his family's new pet. Featured in the image, though, is Lieu's t-shirt that features a fake "Trump, Putin '16" campaign slogan. The Democratic congressman is a notoriously outspoken critic of President Trump and his administration, previously referring to White House chief strategist Steve Bannon as "Dr. Evil," and just last week trolled the commander in chief using a Town Hall event audience. One Twitter user replied to Lieu's post, saying, "Abbot is cute. I love your shirt where did you get it?" -- to which Lieu responded saying he "googled Trump Putin shirt online."